Located right beside the sands, the Calamander Unawatuna Beach lies 4 kilometres from the historic town of Galle. Its beachside restaurant is a popular dining spot for guests both in and outside of the hotel, offering a full service menu, generous buffet option and cuisine choices that include Sri Lankan, Western and a seafood barbecue. The hotel itself is modern with well-equipped rooms and free wi-fi Internet access available across the property. 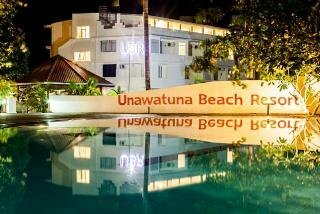 With helpful and friendly staff and a relaxing swimming pool area with ocean views, guests will be assured of a most comfortable and welcoming stay.